Easy barbecue baked beans recipes start with a can or regular baked beans and my super quick recipes is right here. I've actually got a number of barbecue baked beans recipes here for you and to be frank they're all pretty easy, what differentiates them is the time taken to prepare and the variation of ingredients. 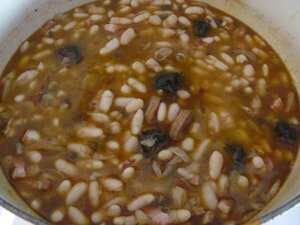 Spanish Baked Beans - Cocido de Montana is a more savoury baked beans recipe traditional in the moountains of Asturias, Spain. Keri's Hog-Apple Baked Beans - I think that this recipe has been flogged to death in that it's appeared in many cook books and recipes sites. That doesn't mean that it's no good and if this is the first time that you've come across it then good for you, it's really worth a try. 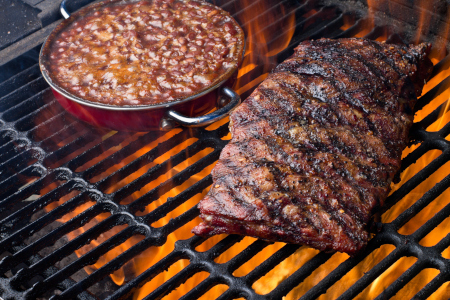 John Roemer's masterpiece baked beans recipe - Barbeque'd Skillet Beans. If you've got all the ingredients to hand then this one is so easy to prepare. Of all the hundreds of barbecue baked beans recipes out there but this one has to be the most easy and quick to prepare. What I've done below is to give you the basic recipe from which to work, after that I've got some option ingredients that you can add if you wish to give your baked beans that added twist. None of the ingredients need any added cooking so it's just a matter of adding those flavors that take your fancy, warm through the bean mixture (the added sugar and mustard powder will dissolve into the mix) and you're ready to go. Now for the optional extras! Depending on how hot and spicy you like your beans I'll leave you with a few options and I recommend using one of them. If you use them all don't come running back to me! Just as with the initial set of ingredients, add the extra of your choice during the warm up phase and nothing more is required. Note that if you choose the option of the fresh chili it may take a little more time for the heat to disperse so give your beans a further 5 minutes on simmer otherwise you might bite on a chunk of chili and blow your head off. Add any of the above at your peril - you have been warned! It's the recipe for anyone like me who likes to make meals from the base ingredients. Baked beans are traditionally made from white haricot beans, you can buy them dried or ready hydrated straight out of the tin. 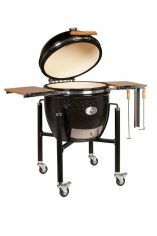 Either way is good but if using dried, you will have to allow for an overnight soak before making the final preparations. The dried beans will cook in the sauce (see below) but I always boil up the beans first in some water because when the beans come to the boil there's a foam that appears on the surface of the water. It's not harmful but I prefer to remove it using a slotted spoon and it's just easier to do this step using water rather than when the beans are in the sauce. Fry the garlic and onions gently in the oil for 2-3 minutes until the onions go clear, then add the remaining ingredients. Bring to the boil, add the hydrated haricot beans, cover and simmer for about 20 - 30 minutes until the beans have softened. You'll find that the tinned ready hydrated beans will need less cooking because they're already soft so it's more about warming through and making sure that the onion and garlic flavors have time to infuse. This barbecue baked beans recipe will make up enough sauce to cover a 400g can of hydrated beans or 100g of dried beans. TIP - Don't be afraid to try out other types of beans. Pinto beans or canellini beans work just as well and if you've got that cheeky style throw in some green flageolet beans for a comedic color! 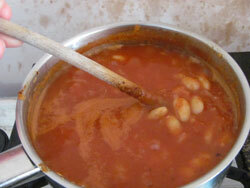 This Spanish creation has to be one of the best baked beans recipes that I've ever tasted. At first I didn't think is was going to be such a great accompaniment to barbecue food but the more I tried it out on my fellow diners, the more convinced I've become. It's not the sweet and sour barbecue taste that prevails. Yes there is sweet and this comes from the “morcilla” or blood sausage (boudin) and the other flavor is spice and this comes with the addition of that great Spanish sausage, chorizo. The proper name for this is cocido de montaña or mountain stew and it's big in the Northern regions of Cantabria and Asturias. Technically to make the authentic stew you'd have to use Asturian beans or fabadas de Asturias but I substituted butter beans without any real trouble. Given the final color of the stew you'd expect there to be tomatoes in the list of ingredients but there isn't. In fact when I first made it I was really concerned because it didn't look the right color when I put all the ingredients together but after a couple hours of cooking, the color and the texture came right to the fore. In a Dutch oven or large heavy pan, soak the beans overnight and change the water. Cover the beans with fresh and bring the beans to the boil. You'll notice that when the water comes to the boil that a layer of of “foam” forms on the top of the water, pour the beans into a colander, rinse them to wash off the foam and then throw them back into the pan. Add the chopped onion, slice the chorizo and morcilla and add these together with all the other ingredients. Now cover the beans with the chicken stock and cook the stew for a couple of hours over a gentle fire or low heat on the stove top. You're looking for a thick consistency to the sauce so if it looks a little runny then remove the lid to the pan for the final 30 minutes of cooking. Don't worry if the morcilla disintegrates, that's all part of making the best baked beans recipes on the planet!